This database contains information compiled from published studies on gas flux from soil following rewetting or thawing. The resulting database includes 222 field and laboratory observations focused on rewetting of dry soils, and 116 field laboratory observations focused on thawing of frozen soils studies conducted from 1956 to 2010. Fluxes of carbon dioxide, methane, nitrous oxide, nitrogen oxide, and ammonia (CO2, CH4, N2O, NO and NH3) were compiled from the literature and the flux rates were normalized for ease of comparison. Field observations of gas flux following rewetting of dry soils include events caused by natural rainfall, simulated rainfall in natural ecosystems, and irrigation in agricultural lands. Similarly, thawing of frozen soils include field observations of natural thawing, simulated freezing-thawing events (i.e., thawing of simulated frozen soil by snow removal), and thawing of seasonal ice in temperate and high latitude regions (Kim et al., 2012). Reported parameters include experiment type, location, site type, vegetation, climate, soil properties, rainfall, soil moisture, soil gas flux after wetting and thawing, peak soil gas flux properties, and the corresponding study references. There is one comma-delimited data file. Figure 1. 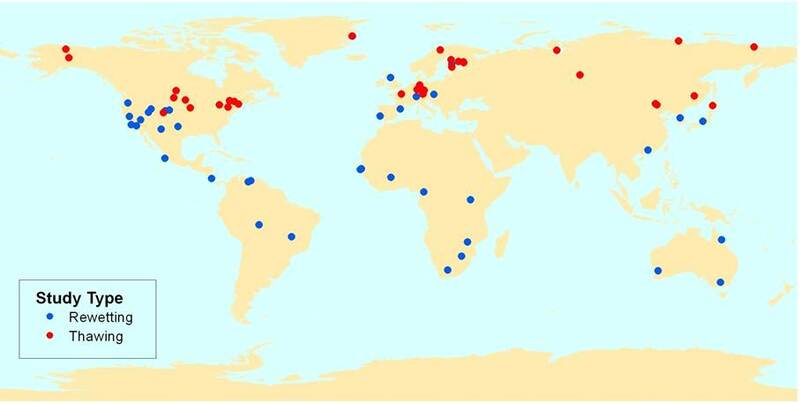 Location of 215 out of 338 cited database observations. The compilers of the Rewetting, Thawing, and Soil Gas flux (RTSG) database (Kim, D.-G., et al., 2012) make it available to the scientific community both as a traditional static archive (ORNL DAAC) and as a dynamic community database that may be updated over time by interested users. The compilers have created a Blog entitled “Rewetting, thawing and soil gas fluxes” (http://rewettingandthawing.blogspot.com/), to provide a place where the scientific community can share and update the fast growing knowledge and data on the study of the effects of rewetting and thawing on CO2, CH4, N2O, NO and NH3 fluxes. The ORNL DAAC will update the database on an annual basis to incorporate changes and additions submitted by the RTSG community via the Google Code site and by Kim, D.-G., R. Vargas, B. Bond-Lamberty, and M. R. Turetsky. Transaction logs for the RTSG-data files will be maintained. Project: Effects of soil rewetting and thawing on soil gas fluxes: a review of current literature and suggestions for future research. This database contains information compiled from published studies on gas flux from soil following rewetting or thawing. The resulting database includes 222 field and laboratory observations focused on rewetting of dry soils, and 116 field laboratory observations focused on thawing of frozen soils studies conducted from 1956 to 2010. Fluxes of CO2, CH4, N2O, NO and NH3 were compiled from the literature and the flux rates were normalized for ease of comparison. Field observations of gas flux following rewetting of dry soils include events caused by natural rainfall, simulated rainfall in natural ecosystems, and irrigation in agricultural lands. File name note: data worksheet will be saved as a .csv file for archiving and renamed. Missing values are represented by blank cells. 21 Rainfall mm Amount of natural or simulated precipitation during a rewetting event. 42 Annual_budget_contrib % Annual Budget Contributions. See referenced study. 43 Surplus_emissions As reported in individual studies. Surplus Emissions. See referenced study. Mosier, A.R., Drijber, R.A., 1998. Greenhouse gas fluxes following tillage and wetting in a wheat-fallow cropping system. Journal of Environmental Quality 27, 1105-1116. http://jeq.scijournals.org/cgi/content/abstract/27/5/1105"
0.077,0.849,mg gas/m2/hr,1000,,,,,,,,"Poth et al., 1995","Poth, M., Anderson, I., Miranda, H., Miranda, A., Riggan, P., 1995. Biogeochemical Cycles 9, 503-513. doi:10.1029/95GB02086 "
Iris lactea var. chinensis and Hippuris vulgaris",0.8,330,sandy loam,1.315,2.575,0.28,6.85,6.3-7.4,,,-10,5,,,,< 5 ug NO m-2 h-1,15 ug NO m-2 h-1,5,15,µg NO/m2/hr,0.0001,0,0.001,mg gas/m2/hr,200,200,,,,,,,"Yao et al., 2010","Yao, Z., Wu, X., Wolf, B., Dannenmann, M., Butterbach-Bahl, K., BrŸggemann, N., Chen, W., Zheng, X., 2010. Soil-atmosphere exchange potential of NO and N2O in different land use types of Inner Mongolia as affected by soil temperature, soil moisture, freeze-thaw, and drying-wetting events. J. Geophys. Res. 115, D17116. doi:10.1029/2009jd013528." Refer to the companion file for the conversion factors-- Conversion factor for Flux measurements from as reported units to normalized units. Flux_pre/ Flux_post converted to Flux_pre_norm/Flux_post_norm. See data file column 33. Rewetting and thawing events are important short-term transitional phenomena in terms of hydrology and the thermodynamics of soil systems. Through this review and the compiled database, investigators identified that major soil gases such as CO2, CH4, N2O, NO, and NH3 are influenced substantially by these events. The mechanisms that control these fluxes during rewetting and thawing events are not fully understood, but are critical for our understanding of C and N dynamics and land-atmosphere gas exchange. Specifically investigators noted that there is a lack of studies on CH4, NO, and NH3 fluxes. Future climatic change is likely to alter the frequency and intensity of drying-rewetting events and thawing of frozen soils. Thus, rewetting and thawing events could become more critical for land-atmosphere gas exchange and may be more important to incorporate in biogeochemical models. Advancements in this research field are likely to come from high frequency measurements of gas fluxes, soil microbial analysis, isotope measurements, and stronger collaborations between the process-based modeling community and the experimental scientific community. Investigators research revealed that overall, the scientific community has a limited understanding both of the responses of soil gases following rewetting or thawing and of their impact on annual budgets. First, this is because of the relative few studies on this topic. Second, many studies report the magnitude of peak flux or increased rate of flux following rewetting or thawing, but often do not identify: (1) whether peak fluxes are significantly different from fluxes of pre-drought or pre-frozen periods, (2) the change in soil moisture or soil temperature, (3) the time lag between rewetting or thawing events and peak fluxes, (4) peak flux durations, (5) cumulative emissions in peak fluxes, and (6) their contributions to annual budgets. Efforts to collect such information will contribute to improving our understanding of the response of gas fluxes to rewetting and thawing events. Changes in the relative proportion of CO2, CH4, N2O, NO, and NH3 (e.g. CO2/CH4) emitted following rewetting and thawing compared with that of pre-disturbance conditions are poorly understood. To report these ratios and the change, additional efforts are required to conduct multiple gases measurements. This is important since a good understanding of the variation of the relative proportion will improve our understanding of the impact of rewetting or thawing on annual gas budgets (Kim et al., 2011). Data on changes in gas fluxes of CO2, CH4, N2O, NO, and NH3 following rewetting and thawing were acquired by searching existing refereed literature published between 1950 and 2010. Investigators searched using Web of Science and Google Scholar with search terms such as “rewetting”, “thawing”, “peak flux”, “peak emission”, and names of gases. Investigators included both field and laboratory studies, but did not include studies of the longer term effects of changing active layer depths in this review, as changes in gas fluxes in response to permafrost thaw are affected by both changing soil and plant successional processes. The resulting data set includes 222 field and laboratory observations focused on rewetting of dry soils, and 116 field and laboratory observations focused on thawing of frozen soils. where Flux change (%) is the relative effect of the event on gas flux, Peak flux_post_event is the rate of peak gas flux following the event and Flux_pre_event is the rate of gas flux before the event (i.e. rewetting or thawing). For studies that compared gas fluxes between simulated (representing either rewetting or thawing treatments) and control treatments (Fig. 2b), investigators calculated changes in gas fluxes exactly as in Eq. (1) but using Peak flux_Exp (the rate of peak gas flux following the treatment) and Flux_Control (the rate of gas flux observed at the control at the time peak gas flux). Figure 2. Hypothetical figures representing peak soil gas flux in rewetting of dry soils and thawing of frozen soils and peak flux period. 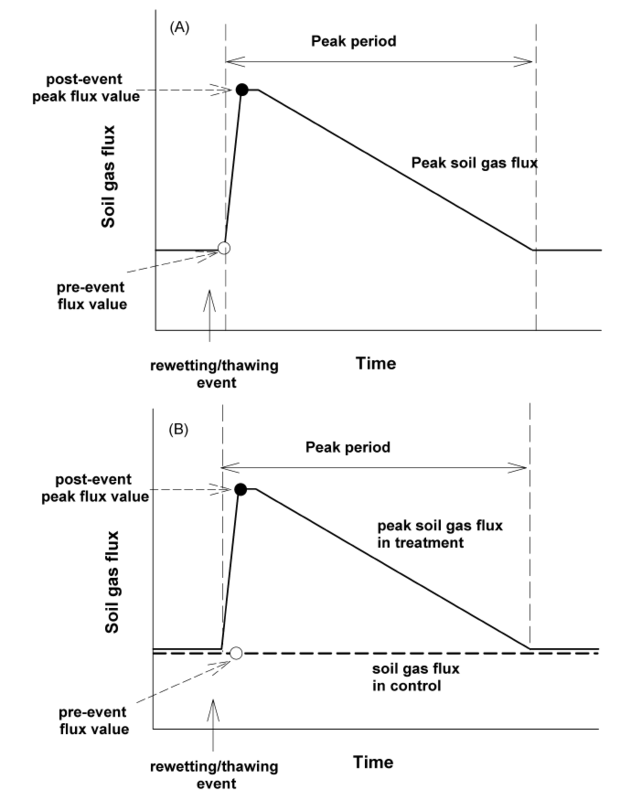 (A) Peak gas flux in natural rewetting or thawing event (solid line) and pre-event flux value (white dot) and post-event peak flux value (black dot) were used to determine flux change rate; (B) peak gas flux in rewetting or thawing treatment (solid line) and gas flux in control (dashed line) and pre-event flux value (white dot, the flux value in control when post-event peak flux value is read) and post-event flux value (black dot) used to determine flux change rate. Data on changes in gas fluxes of CO2, CH4, N2O, NO, and NH3 following rewetting and thawing were acquired by searching existing refereed literature published between 1950 and 2010. Investigators searched using Web of Science and Google Scholar with search terms such as “rewetting”, “thawing”, “peak flux”, “peak emission”, and name of gases. Investigators included both field and laboratory studies, but did not include the longer term effects of changing active layer depths in this review, as changes in gas fluxes in response to permafrost thaw are affected by both changing soil and plant successional processes. The resulting data set includes 222 field and laboratory observations focused on rewetting of dry soils, and 116 field and laboratory observations focused on thawing of frozen soils. Overall, change rates of CO2, CH4, N2O, NO, and NH3 fluxes of pre- and post-rewetting and thawing events were determined by fitting linear models to the relationship between flux pre-event and peak flux post-event for both rewetting and thawing events. All analyses were performed using R 2.12.1. (R Development Core Team, 2010). If gas fluxes were presented only in a figure without numeric values reported in text or tables, investigators calculated the corresponding values from the figure.